Razer launched the Core v2 eGFX enclosure in Q4 2017. It came with a unique industrial design and dual Thunderbolt 3 controllers that justified its price premium over other eGFX enclosures. Today, coinciding with the introduction of the Razer Blade 15.6, Razer is launching the Core X eGFX enclosure. 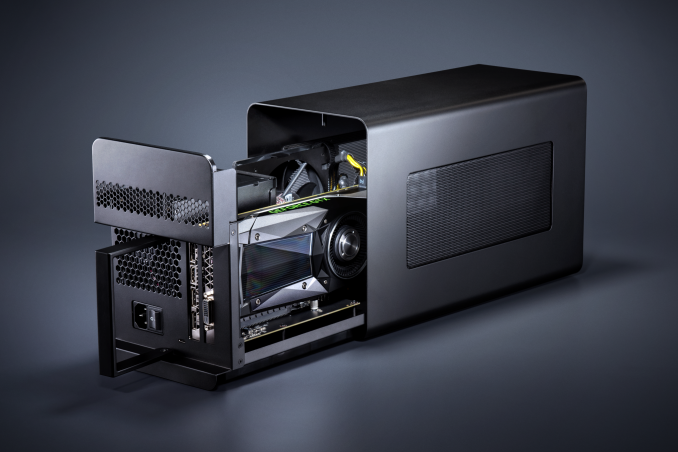 The Razer Core X does away with the bells and whistles of the Core v2 - the chassis is more economical to manufacture, thanks to a simpler industrial design. The second Thunderbolt 3 controller is gone, as are the I/O extension ports - the Core X serves as a eGFX enclosure and supports only a PCIe 3.0 x4 peripheral. That said, the Core X supports larger graphics cards compared to the Core v2. The internal power supply is also an ATX 650W one (compared to the 500W Flex-ATX PSU in the Core v2). This allows the Thunderbolt 3 port to support power delivery up to 100W (compared to the 65W in the Core v2). The Core X also uses the Alpine Ridge C-stepping, unlike the Core v2 which used an older stepping of the controller. The Core X doesn't support Razer Chroma (the RGB lighting feature common across various Razer peripherals). All these changes allow Razer to price the Core X at $299 compared to the Core v2's $499. The Core X launch also brings Mac support to Razer's family of eGFX enclosures (Core v2 and Core X only). Similar to the Core v2, the Core X is designed with open vents to support adequate airflow for the installed GPUs and aid in optimal thermal performance. 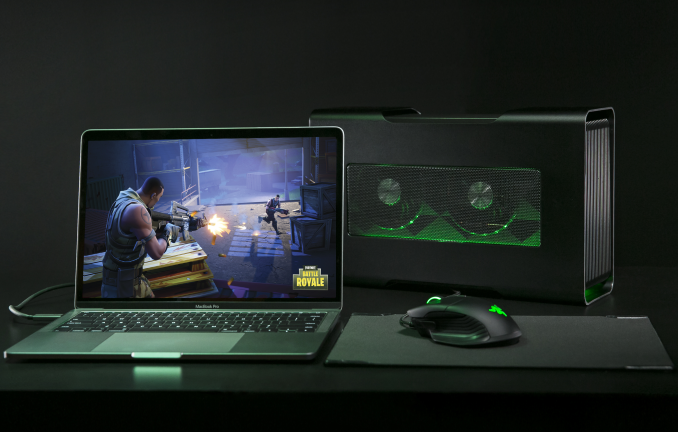 Razer also touts easy installation of GPUs - a rear panel that slides out and a thumb-screw that allows for tool-less installation - as a major selling point for the Core X. macOS compatibility is advertised only with AMD GPUs. On the Windows side, a wide variety of GPUs ranging from the NVIDIA GTX 750 to the GTX 1080 Ti and GTX Titan XP. NVIDIA Quadro GPUs are also supported. On the AMD front, all XConnect GPUs are supported. The table below presents the specifications of various eGFX enclosures currently announced / available in the market. Chassis Dimensions 14.72" x 6.61" x 9.06" 14.72" x 6.61" x 9.06"
Max. GPU Dimensions 12.99" x 2.36" x 6.29" 12.99" x 2.36" x 6.29"
A look at the table above shows that the Core X presents a unique value proposition for users dealing with bulky GPUs. There are other eGFX enclosures supporting similar-sized GPUs, but, they come with a much higher price tag. Those around the Core X's price point tend to support only smaller GPUs, or, not support more than 15W on the power delivery side. From that perspective, the Core X complements the premium nature of the Core v2, and allows Razer to target different segments of the eGFX enclosure market. Unfortunately, stacking a GPU and an off-the-shelf (i.e. easily replaceable should it fail) ATX PSU makes for an unwieldy package, as their dimensions don't exactly match up. Using SFX-L PSUs alleviates this somewhat, but only to a tiny degree. FlexATX is kind of an option, but brings with it hellish small-diameter cooling fans. Also, they maximize space for GPUs to not exclude people wanting to stick gargantuan triple-fan coolers in there. The result is a poorly space-optimized design with plenty of air inside. I believe part of the price comes from Intel's TB3 controllers, but also from manufacturing a niche product. It's a bit of a catch-22 - they're too expensive to catch on, but won't catch on until they become cheaper.